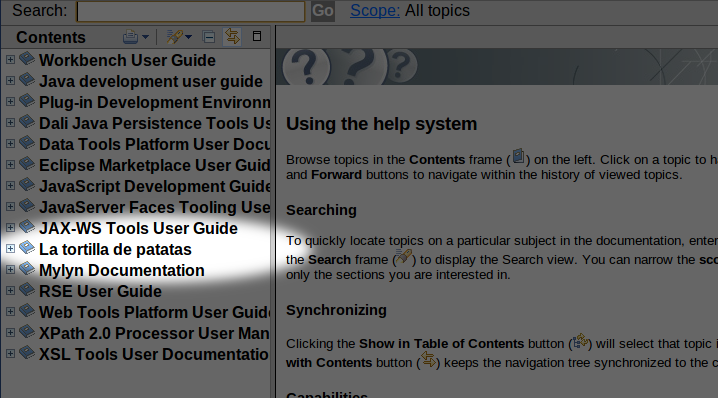 Eventually I've found the steps for getting the eclipse infocenter as an standalone application. have done all the staff of isolating the infocenter as an standalone application for us. So the only thing we have to do is download the jar file who has provided and install it in a tomcat directory. Then we have to start tomcat and point our browser to http://localhost:8080/infocenter/index.jsp: in my case I've installed the contents of the war file in the directory infocenter. The help documentation is stored with the plugin information, under WEB-INF/plugins. The infocenter software scans all the plugins for a file called plugin.xml and use the information stored in it to display one of the contents. I've called this directory upon this website, but you can pick up whatever name you want. name="La tortilla de patatas, ese desconocido"
Of course, the values “name”, “id”, “version”, etc. can be configured with your own values. 3.4 And finally provide this toplevel.html and section1.html elements. They are usual html pages. After this, just wait until tomcat rescans the application or simply restart tomcat again: when it's done, the infocenter will index the new content and it will appear again.